Special Announcement: Last week three of our clients were featured worldwide on the front page of the iTunes App store at the same time. Congrats to all of you! It's now even easier to get started using OneSignal! We're excited to announce that we've streamlined all of our documentation into one place. Getting started using OneSignal across all of your apps has never been more easier! Whether you're building an app natively or using a 3rd party development platform, we've got you covered from iOS to Windows Phone and more! Our SDKs will now automatically track when users make purchases in your application with no additional setup required. You can target notifications to users who have and haven't paid. You can also create segments based on what purchases users have made and how many they bought. To start tracking purchases, please update to the latest version of our SDK for your platform. 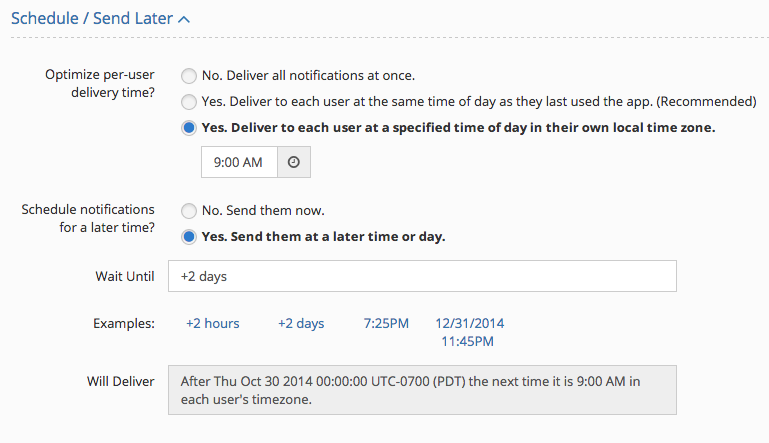 It's now easier to schedule notifications to start being delivered at a specific time in the future and to distribute notifications based on when users were last active or based on their timezone. Our API now allows you to dynamically target users based on their tags, without needing to create a segment. As always, thanks for your continued support! We hope to make OneSignal the best solution for Push and we can't do it without you! Interactive Notifications with iOS 8 and Android 4.1 and more!